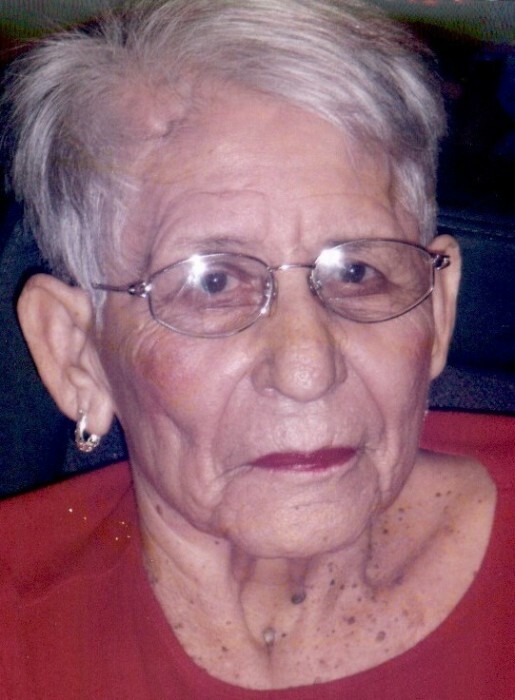 Josefina “Chepa” Z. Loera, 85, entered eternal rest on Wednesday, December 5, 2018 at Solara Hospital in McAllen, Texas. She was born on Tuesday, June 27, 1933 in Mercedes, Texas to Gregoria Zavala and Dominga Sandoval Lucio Loera. She is preceded in death by her parents, husband; Joaquin Loera, brothers; Marcos Zavala, Jose Zavala, Pedro Zavala, Bruno Zavala and Casimiro Zavala. She is survived by her children; Adan (Lupita G.) Luna, Jr., Jesse (Maria S.) Rosalez, Norma (Alonzo) Richmond and Matt (Eva) Zavala, companion; Martin Salinas, 18 grandchildren, 23 great grandchildren, numerous nieces and nephews. Chepa lived in Edinburg most of her life and was a member of Holy Family Catholic Church. She worked for George J. Pardi Produce Company for over 25 years. She enjoyed washing, gardening and cooking. Her children and grandchildren loved her homemade tortillas. She was a loving mother, grandmother and great grandmother. Her family will receive friends on Sunday, December 9, 2018 from 4:00 PM – 9:00 PM with a Rosary to be prayed at 7:00 PM in the Chapel of Peace at Ceballos-Diaz Funeral Home, 322 East Kuhn Street in Edinburg. Catholic Mass will be celebrated on Monday, December 10, 2018 at 2:00 PM at Holy Family Catholic Church, 1302 East Champion Street in Edinburg. Catholic burial will follow to Hillcrest Memorial Park Cemetery, 1701 East Richardson Road in Edinburg. Funeral services have been entrusted to Johnny Garcia, Manager/Funeral Director and Staff of Ceballos-Diaz Funeral Home in Edinburg.